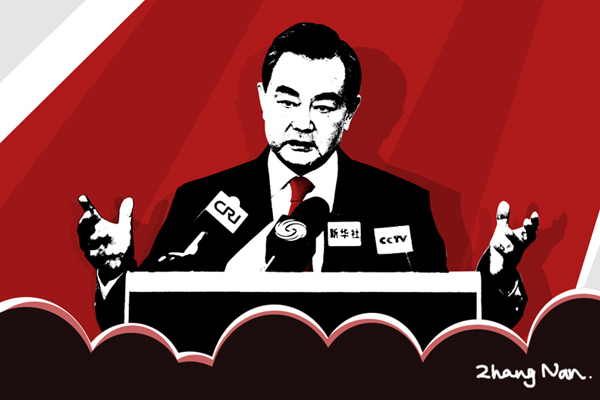 Chinese Foreign Minister Wang Yi has made a strong statement against the militarization of the South China Sea. He took a hard line on the South China Sea, saying it was a region vital to China's national interests and its security must be guaranteed. Speaking to reporters in Beijing, Wang said no use of the principle of freedom of navigation could justify other nations seeking to militarize an area and do what they liked there - an obvious dig at the U.S.
"It is a pressing task for China's diplomacy to better protect its growing overseas interests," Wang said, using a heavily realist argument regarding Chinese state interests that naturally created a stir in foreign media. But it's also important to note that around the same time, U.S. President Barack Obama gave an interview of great significance in the twilight of his presidency that talked about some similar theoretical frameworks. Arguing his position on different foreign policy issues, he emerged as a self-described staunch realist. This interview is important as we approach the November elections, and, going by the current crop of contenders, posterity may well remember Obama kindly if for no other reason than his aversion to military adventurism. Obama justified his realist stance by saying the United States cannot do much in Middle East, and this marks him as the first president able to think outside framework set by the DC foreign policy establishment when it comes to intervention in Syria. On Syria and Ukraine, he acknowledged that Russia was the great power of the region, and no matter how harmful to the world order, Ukraine and Syria are not in American interests in the same way that they are in Russia's core sphere of interest. He consistently mentioned the need for dialogue with Russia to resolve the two issues, and showed reticence to wasting American blood and money defending areas of land not of vital interest to the U.S.
Judging by recent statements, China and the United States are really on the same wavelength in regard to national interests if only Americans would realize it.